Christian Olvera at Taqueria El Rey restaurant in Dalton, Ga. He has lived in Dalton most of his life with his parents, who are in the country illegally. 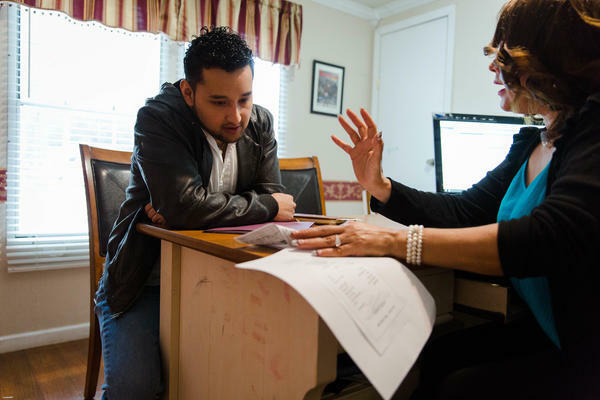 Christian Olvera, a DACA recipient, talks with public notary Enedina Acosta about his taxes. 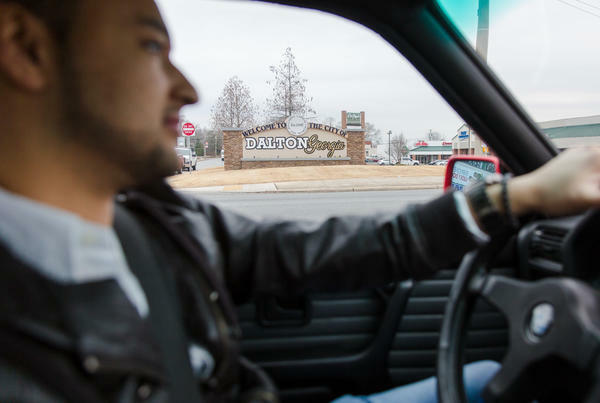 Olvera, 26, behind the wheel in Dalton, Ga., where he's lived most of his life. Olvera's DACA status allows him to have a driver's license. 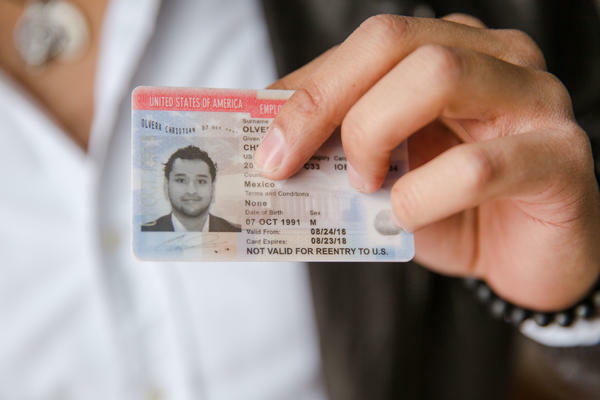 Christian Olvera, 26, a DACA recipient, shows his Employment Authorization Card, which expires later this year. 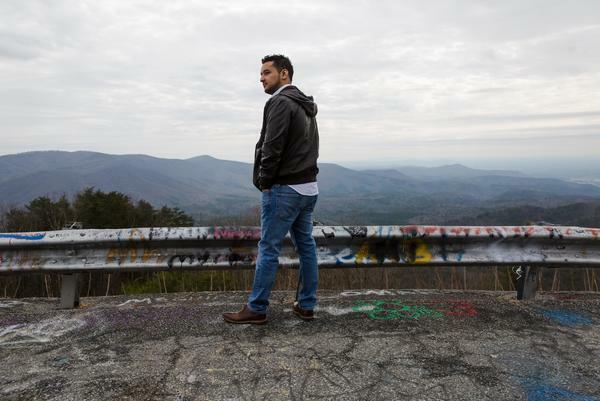 Olvera stands at a popular overlook at Fort Mountain near Dalton, Ga. Olvera often drives to this spot, which includes many sharp mountain curves, to clear his mind. 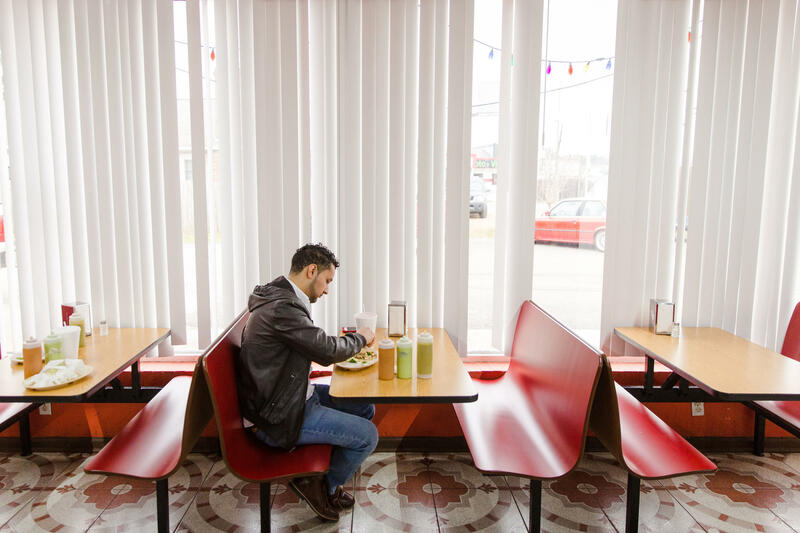 "I'm far away from where I was born, but this land is home," he said. "I'm part of this land now." Christian Olvera's parents know how to drive. But they're afraid to, because they're in the country illegally, and they don't have driver's licenses. So most days, Olvera drives them to work. Olvera is 26 years old, and looks even younger, with curly black hair and a baby face. But he's taken on a lot of responsibility. On paper, Olvera owns the family business. Even the house where they live, on a leafy street in Dalton, Georgia, is in his name. "People ask me, do you still live with your parents?," Olvera joked. "I'll say no, my parents live with me." The reason Olvera can do all these things for his family is DACA, or Deferred Action for Childhood Arrivals. The Obama-era program protects about 700,000 of the so-called DREAMers — people who were brought to the country illegally as children — from deportation, and allows them to work legally. But those protections are in jeopardy unless Congress takes action. The Senate will turn its attention to hashing out an immigration deal this week. And there's a lot stake — not just for the DREAMers, but for all the parents, siblings and other relatives who rely on them. Olvera has talked publicly about his family's situation and lobbied Congress for legislation to protect DREAMers. His mother and father arrived in the U.S. on a temporary visa almost 20 years ago, and stayed. The family wants to share their story but the parents asked not to be named because they fear being deported. Still, Olvera's mother says her family can have a better life here. "If you're a respectful, educated, hard-working person," she said through a translator, "the U.S. will always open its doors for you." It was DACA that opened doors for the family, by giving Olvera and his brother protection from deportation. DREAMers often become the de facto ambassadors for their families, in many aspects of daily life. The family bank accounts and credit cards are often in their names. They fill in for parents who are scared to attend parent-teacher conferences. They're able to go to college and get better jobs. 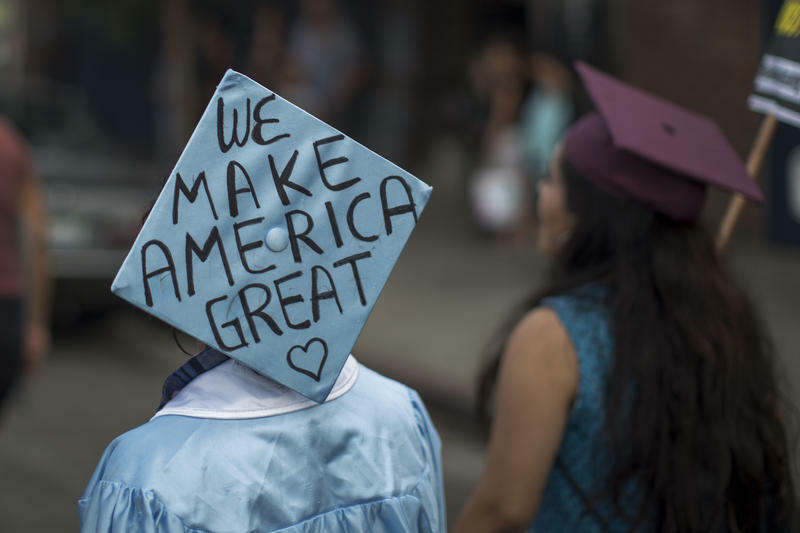 One study found that DACA improves the economic situation of almost two-thirds of these families. But the Trump administration has moved to end DACA as early as March, saying that Congress needs to come up with a replacement. Olvera says his protections would expire in August. "I'm like a jug of milk, man. It's marked on there, and you don't know what to do after that," he said. "There's a lot of things that go into limbo." Polls consistently show that a majority of Americans favor allowing DREAMers to stay in the country. But common ground in Washington has been hard to find. The White House has floated a plan that includes a pathway to citizenship for nearly 2 million DREAMers. That number includes the roughly 700,000 who are currently protected by DACA. But in exchange, the Trump administration and hardliners in Congress want other concessions. "Any solution on DACA has got to include border security, including a wall. And an end of chain migration," said Republican Senator David Perdue of Georgia in remarks on the Senate floor last month. Perdue and President Trump want the U.S. to allow in more immigrants with desirable skills. The current policy, which they call "chain migration," emphasizes family reunification. That change could have big implications for the DREAMers and their parents. Immigration hardliners worry that if the DREAMers are allowed to become citizens, their families could, too. "This is now a mass amnesty vehicle for many that were brought here through no fault of their own," said R.J. Hauman, the director of government relations at the Federation for American Immigration Reform, which advocates for much lower immigration levels. "The fault has to lie somewhere, and that lies in the parents," Hauman said. 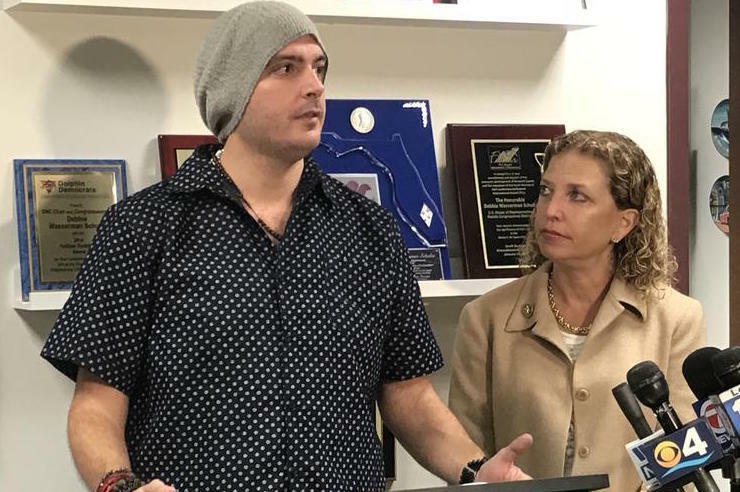 "And that's a huge issue of why you have to end chain migration. So these people cannot turn around and sponsor the people who actually broke the law, and who brought them here illegally." 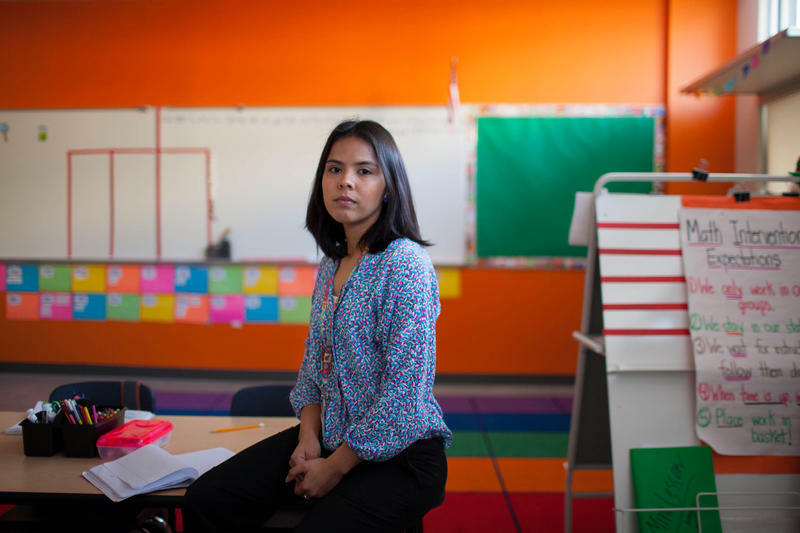 Even without legal status, the parents of many DACA recipients have found ways to build lives and businesses. In Mexico, Olvera's father was an architect. When the family moved to Georgia, he worked in a carpet mill. Now the family owns a photography studio in Dalton. Olvera says his father started taking photos at birthday parties and weddings. "He took that design creativity and started picking up photography here," Olvera said. "It's something you could do freelance. And it grew into an idea. And then, with DACA it was fortified as a business." Olvera is helping out with that family business for now. What he really wants is to go away to college. But he feels like he can't do that. "I'm just scared honestly of that one call saying hey, your father's been detained," Olvera said. "And I'm going to blame myself for that, because I wasn't there to drive them." There's a lot at stake in this immigration debate not just for the DREAMers but for all the parents, siblings and other relatives who rely on them. NPR's Joel Rose has this profile of one DREAMer in Georgia who's gone public with his family's story. JOEL ROSE, BYLINE: Most days, Christian Olvera drives his parents to work. They live on a leafy street in Dalton, Ga. It's about a 15-minute drive to the family business. Christian Olvera is always the one behind the wheel. CHRISTIAN OLVERA: I don't really think about it anymore. It's just - it's second nature now. It's no big deal. ROSE: Olvera's parents know how to drive, but they're afraid to because they're in the country illegally. They don't have driver's licenses. And in Georgia, that is a big deal. Driving without a license can get you arrested and even deported. Olvera has taken on a lot of responsibility. He's 26 but looks even younger with curly black hair and a baby face. OLVERA: People will ask me, you know, you still live with your parents? I'll say no. You know, my parents live with me (laughter). ROSE: On paper, Olvera owns the family business. Even the house where they live is in his name. Olvera's mother and father arrived in the U.S. on a temporary visa almost 20 years ago and stayed. The family wants to share their story, but the parents asked not to be named because they fear being deported. Still, Olvera's mother says her family can have a better life here. If you're a respectful, educated, hardworking person, she says, the U.S. will always open its doors for you. ROSE: It was a program known as DACA - or Deferred Action for Childhood Arrivals - that opened doors for the family by giving Christian Olvera and his brother temporary protection from deportation. DREAMers often become the de facto ambassadors for their families in many aspects of daily life. The family bank accounts and credit cards are often in their names. They fill in for parents who are scared to attend parent-teacher conferences. They're able to go to college and get better jobs. One study found that DACA improves the economic situation of almost two-thirds of these families. But now, those gains are in jeopardy. The Trump administration has moved to end DACA as soon as March, saying that Congress needs to come up with a replacement. Olvera says his protections would expire in August. OLVERA: That's an expiration - I'm like a jug milk, man. It's marked down there, and you don't know what to do after that. ROSE: Polls consistently show that a majority of Americans favor allowing DREAMers to stay in the country, but common ground in Washington has been hard to find. The White House has floated a plan that creates a pathway to citizenship for nearly 2 million DREAMers. That includes about 700,000 who are currently protected by DACA. In exchange, the Trump administration and hardliners in Congress want other concessions. DAVID PERDUE: Any solution on DACA has got to include border security, including a wall, and an end of chain migration. ROSE: That's Republican Senator David Perdue of Georgia. He and President Trump want to allow in more immigrants with desirable skills. The current policy, which they call chain migration, emphasizes family reunification. That change could have big implications for the DREAMers and their parents. Immigration hardliners worry that if the DREAMers are allowed to become citizens, their families could, too. R.J. Hauman is with the Federation for American Immigration Reform, which advocates for much lower immigration levels. R.J. HAUMAN: This is now a mass amnesty vehicle for many people that were brought here through no fault of their own. The fault has to lie somewhere, and that lies in the parents. And that's a huge issue again of why you have to end chain migration, so these people cannot turn around and sponsor the people who actually brought them here illegally. ROSE: Even without legal status, the parents of many DACA recipients have found ways to build lives and businesses. OLVERA: This is our small shop. ROSE: In Mexico, Christian Olvera's father was an architect. When the family moved to Georgia, he worked in a carpet mill. Now the family owns a photography studio in Dalton. Olvera says his father started taking photos at birthday parties and weddings. OLVERA: He took, you know, that design creativity and just started picking up photography here. And it's something that you could do freelance. And it grew into an idea. And then with DACA, it was fortified as a business. ROSE: Olvera is helping out with that family business for now. What he really wants is to go away to college, but he feels like he can't do that. OLVERA: I'm just scared honestly of that one call saying, hey, your father has been, you know, detained. And what do I do? And I'm going to blame myself for that because I wasn't there to drive him. ROSE: Christian Olvera says his family will be watching the immigration debate in Congress, but they'll keep building a life here no matter how it turns out. Joel Rose, NPR News, Dalton, Ga. Transcript provided by NPR, Copyright NPR.